Greater Manchester's Mobikes have disappeared from the region's streets during an unannounced period of maintenance. Puzzled cyclists reported being unable to find the distinctive orange-trimmed bikes in recent days. Mobike later confirmed the cycles were removed for upgrades ahead of plans to widen the bike-hire service. The scheme, backed by Manchester and Salford councils, launched in June with 1,000 cycles made available. Managed via an app, they can be used for short journeys and there are no docking stations, unlike similar schemes in London and Liverpool. The company said the cycles had been removed while improvements to the app are made, and would return from Wednesday. The changes will see preferred drop-off and pick-up locations for the bikes shown on a digital map. Steve Pyre, general manager for Mobike in the UK, apologised for not warning cyclists of the plans in advance. He added: "It's all about taking stock and taking the lessons we've learnt in five months of operation and coming back bigger and stronger." Meanwhile, in a recent blog post, the firm said the bikes were "becoming too dispersed throughout the city" and it had decided to temporarily shrink the area of central Manchester in which they operate. "Over the coming months, we will gradually increase the number of bikes as well as the size of the geographic area to include more parts of the city," the company wrote. 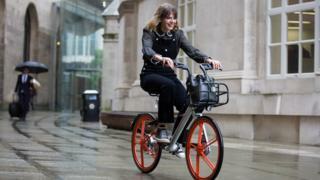 Mobike has recently also starting operating in London, Newcastle and Oxford. There were a spate of vandal attacks on the bikes shortly after the launch in Greater Manchester.